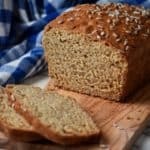 Home » Breads » Honey Wheat Bread: Yeast Free! This post was originally published on June 4, 2015 and republished on February 22, 2019 with updated content, photos and a video (located in the recipe card). Thanks for watching and sharing. Let me repeat: NO yeast, NO knead, quick whole wheat bread! A bread recipe without yeast is the simplest definition of quick breads. Baking soda or baking powder (or a combination of both) is used as the leavening agent to get a quick rise. Another great example of a quick bread recipe is Irish Soda Bread. 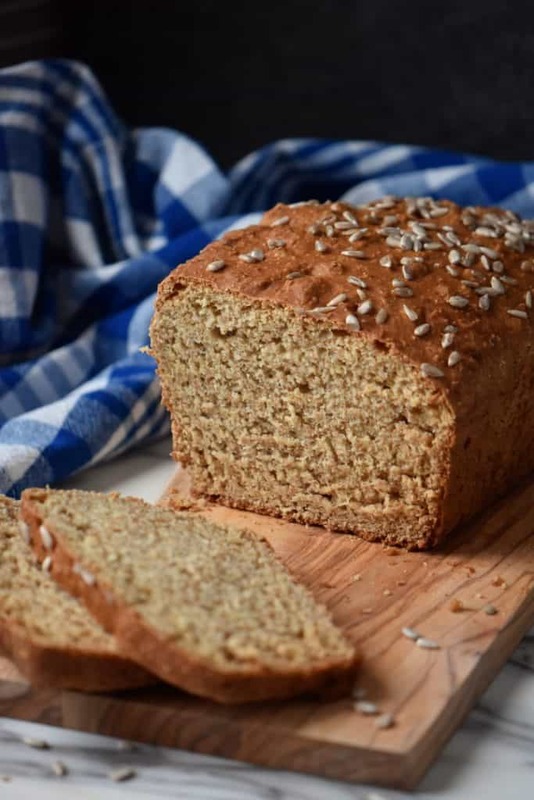 If you like caraway seeds, you are going to love this soda bread recipe. Foods such as muffins, cornbread, scones, biscuits, loaves are all different kinds of quick breads. In a way, it’s the fast food version of bread! You won’t believe how easy it is to make this homemade wheat bread. Just three easy steps. Are you ready? What do I need to make this Honey Wheat Bread? Whole wheat flour. A great way to get that fiber we all need! Baking soda. This will provide the bread to rise. Salt. Not much, just a few pinches. Buttermilk. A wonderful addition in quick breads. Olive oil. Adds a fruity element. As far as accessories are concerned, you don’t need much. You need two bowls, a whisk, a wooden spoon and a 9 x 5 rectangle baking pan. That’s it! The first thing we are going to do is either grease and flour or spray non-stick spray in a 9 x 5 (2L) loaf pan. It is important to get your pan ready before you begin this recipe as the baking soda will start reacting as soon as it comes into contact with the dry ingredients. Set the pan aside while we measure and combine the ingredients. 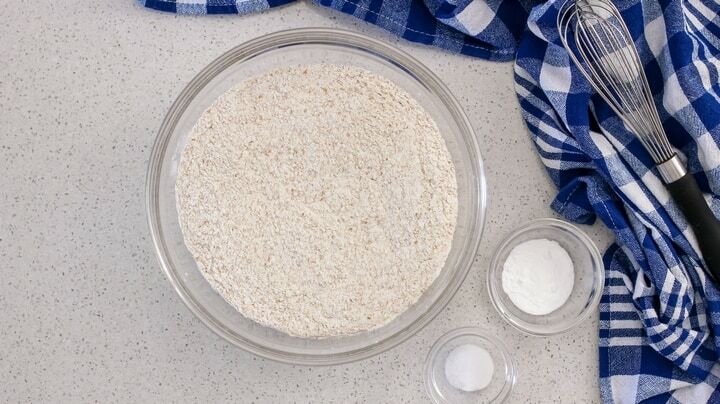 In a large mixing bowl, whisk together the whole wheat flour, baking soda and salt. Take a few minutes to properly whisk these ingredients together to ensure even distribution of the baking soda. Set it aside while we combine the wet ingredients. In another large mixing bowl, whisk together the buttermilk, olive oil and honey. Add the liquid ingredient to the dry ingredients and with a wooden spoon stir to combine. You will notice that the mixture comes together very quickly. Immediately transfer the batter to the 9 x 5 loaf pan. 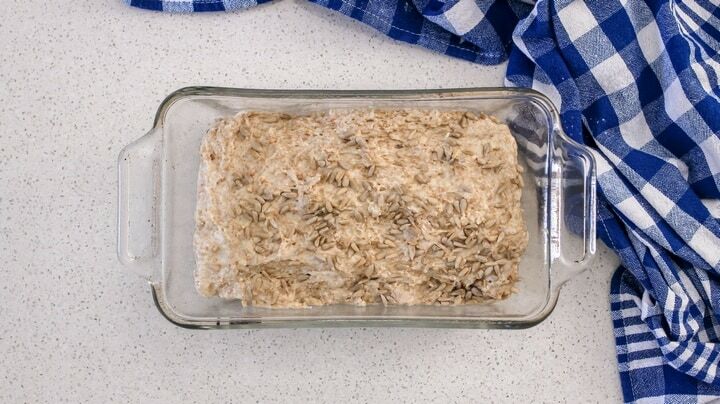 As an optional step, sprinkle the top of the loaf with about one tablespoon of sunflower seeds. The last thing to do is to place the pan in a preheated oven at 300℉ (150ºC) for about 55 minutes. 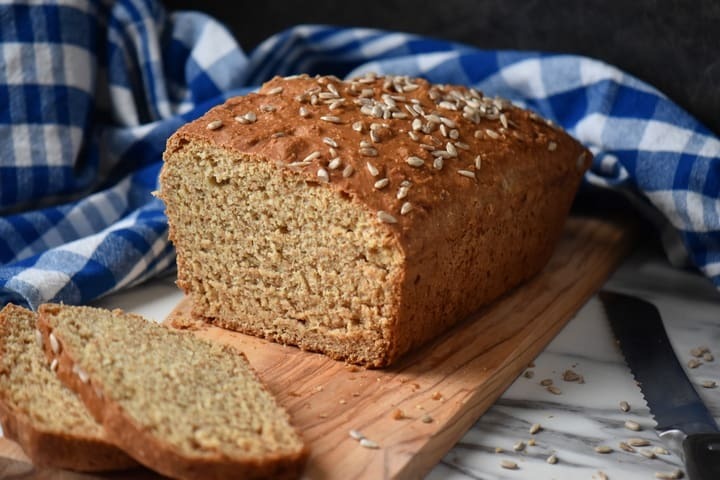 Once you remove this basic whole wheat bread recipe from the oven, allow it to cool down on a wire rack for 10 minutes before removing it from the pan. Preheat your oven to the right temperature.. Properly whisking together your dry ingredients ensures even distribution of the baking soda or baking powder, which will in turn ensure a uniform rising in your bread. Do not over stir; combine wet and dry and stir until moistened…resist the urge to keep stirring. The minute you combine your wet and dry ingredients, immediately place the mixture in your pan and in the oven. The “lifting” component of the soda (which is really the carbon dioxide) starts reacting as soon as it’s in contact with the wet ingredients. 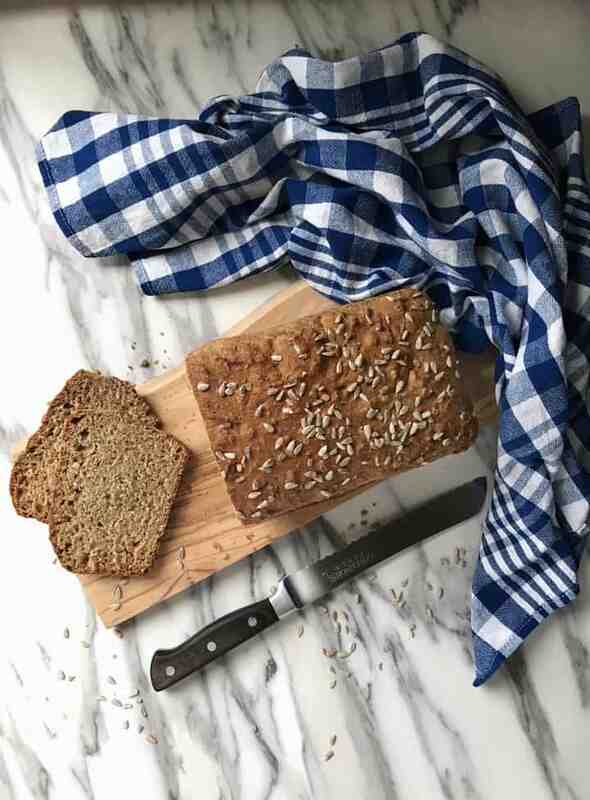 This quick whole wheat bread recipe is from my collection of recipe booklets from Robin Hood. Does anyone remember those? I’ve had this recipe for years but I never got around to trying it until recently. To be honest, I had some whole wheat flour that was expiring and I finally remembered I had tagged this recipe. It was so good that I’ve already made it 3 times this week. I actually had to go buy more whole wheat flour! As usual, I’ve made a couple of changes: I decreased the amount of salt and I used olive oil in the recipe. If you are expecting a light airy bread, this is not the recipe for you. This quick whole wheat honey bread provides a crumb which is dense and soft and, you know what, it works! I am enjoying mine right now, toasted and with a little bit of Almond Butter – yum! It only takes 5 minutes of prep time and less than one hour in the oven! 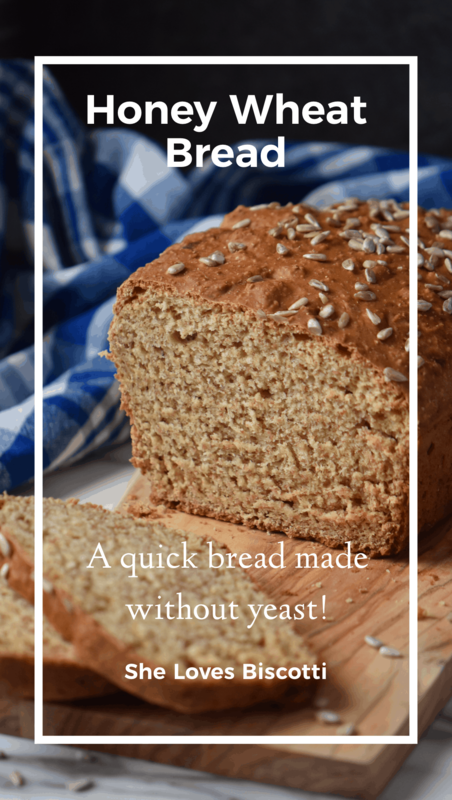 If you have ever wondered how to make bread without yeast, this is the recipe for you! 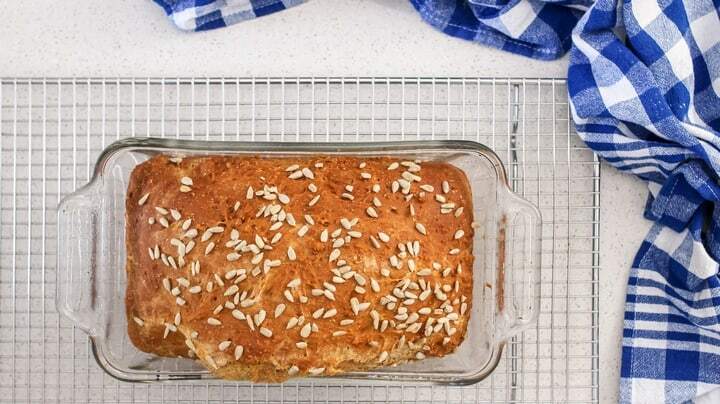 Are you ready to make this honey whole wheat bread recipe? ★★★★★ If you have made this Honey Bread recipe, I would love to hear about it in the comments below and be sure to rate the recipe! This no yeast, quick whole wheat honey bread provides a crumb which is dense & soft that is just great toasted! This recipe is really too simple not to try. 1 tablespoon sunflower seeds Optional, to sprinkle over the top. Preheat oven to 300℉ (150ºC). Spray 9" x 5" (2 L) loaf pan with non-stick spray. 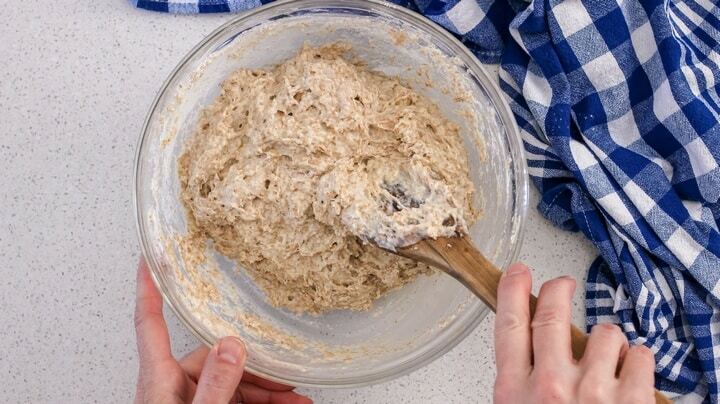 In a very large mixing bowl, whisk together the whole wheat flour, baking soda and salt. Set aside. 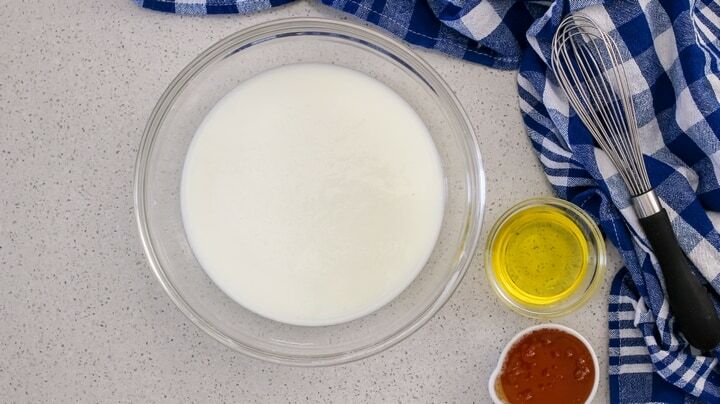 In a medium bowl, whisk buttermilk, honey and oil together. Combine this mixture to the dry ingredients and mix only until combined with wooden spoon. Place batter in a pan. If using, sprinkle top with sunflower seeds. Bake for approximately 55 minutes or until done. Remove from oven and let cool on a wire rack for about 10 minutes before removing bread from pan. Cool completely before slicing. Do not over stir; combine wet and dry and stir until moistened...resist the urge to keep stirring. The minute you combine your wet and dry ingredients, immediately place the mixture in your pan and in the oven. The "lifting" component of the soda (which is really the carbon dioxide) starts reacting as soon as it's in contact with the wet ingredients. I made this last night, smelled so delicious while baking. Breads don’t smell that great, it could be the honey and buttermilk that did the trick. It’s also not dense like most wheat breads I have made so far 😋😋😊😊 I made it in a springform pan, it looks really pretty. Next I will be making the soda bread. Actually this bread was done baking even before the dough for the yeast bread was done with the first proofing. I really love your recipes. The videos are short and very professionally edited too. I meant whole wheat breads that I have made so far don’t smell great and they are also dense. I am slowly adding the weight in grams to all the recipes as I feel there is so much variation when it comes to weighing and it can really have such an effect on the final product. Once again, great comment! OH MAN, I am a friend for bread as well. Daily toast – no negotiating. And this bread looks absolutely gorgeous, so grainy and hearty, and that crust! Killer! I would love a slice of this bread with strawberry jam! I love that you used whole wheat flour, and that it bakes in less than an hour to bake. Great recipe, Maria! Delightful recipe. Just made and it turned out great. Super super easy to make. Maria once again you’re recipes are the best. P.S. For some weird reason I can’t rate your recipes but they’re all five stars, no doubt. This sounds so good! I’m thinking of adding a little cinnamòn and some raisins!